Double sided patchwork quilt. Machined squares and rectangles joined in strips and then the strips joined. 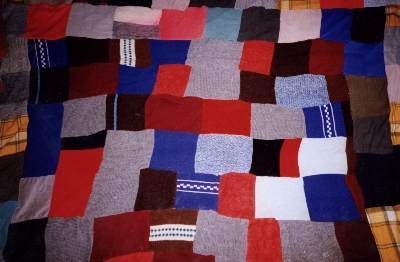 Wide variety of materials, mainly woollen from hand or machine knitted jumpers, many patched. All materials came from worn garments from family and friends of the maker. No padding. This is typical of the many quilts made by Elsie Shephard of Rosewood NSW over a 20 year period from 1957 for use in her home. Elsie donated it to The Pioneer Women's Hut. It is displayed occasionally in the museum. When my husband was seriously hurt in a road accident in 1956 he was in hospital for a year then another two years recovering until he was fit enough to get a permanent job. There were no Government handouts to needy families then so you had to do your best to balance the budget and make ends meet. Having a young family people were very kind to me, giving me clothes for my children their children had grown out of that were in good order, some were slightly worn and needed patching. My eldest daughter slept in the coldest room ub the house. One night I finished her rug, put a lining in it and put it on her bed when she was asleep. It was that heavy that during the night she woke up thinking an animal was on top of her bed! I took the lining out."